Are you staring at skin and hair that will not cooperate this winter? Well fret not, experts tell you how you can take care of your skin and hair this season so you can look haute when it is so cool! Dry skin is the biggest and most common problem as the skin can get flaky as humidity levels go down and the lack of moisture in the air causes irritation. Preeti Seth, Wellness Expert, Pachouli Spa & Wellness Centre Delhi says, “our hair and skin are very sensitive to external factors like climatic changes and weather conditions. Every season our skin and hair needs to be taken care of. Also, winter season brings with it an array of wonderful fruits, vegetables and fresh produce. It is the time when hunger pangs increase and our body craves for good food. 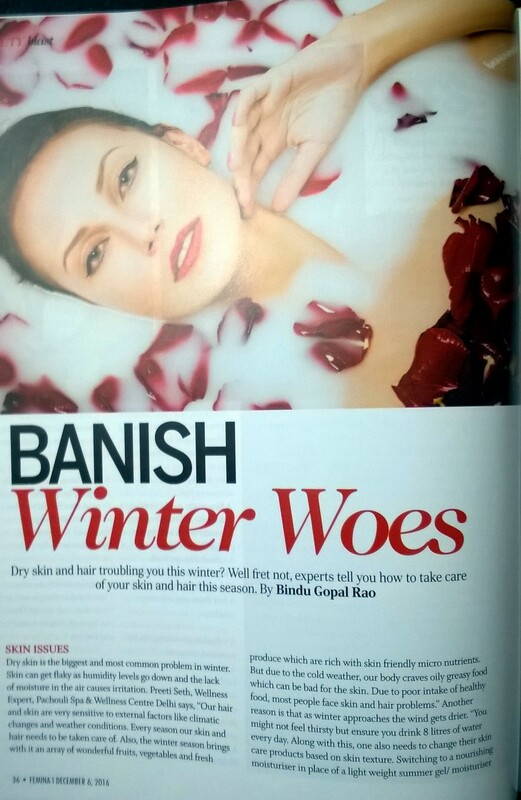 Due to poor intake of healthy food, most people face skin and hair problems.” As winter approaches the wind gets drier. “You might not feel thirsty but ensure 8 liters of water intake every day. Along with this, one also needs to change their skin care products based on skin texture. Switching to a nourishing moisturizer in place of a light weight summer gel/ moisturizer is the basic while those who have acne prone skin might still want to stick to their anti bacterial cosmetics for oily/acne prone skin. Use of serums and oil capsules at night is a good way to rejuvenate dehydrated skin and repair any damage caused during the day,” says Aakriti Kochar, Beauty & Make-up Expert, Oriflame India. An easy and simple tip to follow in winter season is to have a proper balanced diet. “A diet consisting of vitamin and minerals will help in keeping your skin fresh and healthy. Make this your habit to drink lots of water even when you are not thirsty at the time. This will keep you hydrated,” says Bharti Modi, Herbal Beauty Expert & Director, Vedic Line. “Hot water showers feel great in winter, but they wreak havoc on dry skin. Try a lukewarm shower instead, and then pat your skin dry with a towel. Your hands, feet, knees and elbows need to be looked after too, during winter. Use products containing shea butter, petrolatum, mineral oil, tea tree oil or glycerin. 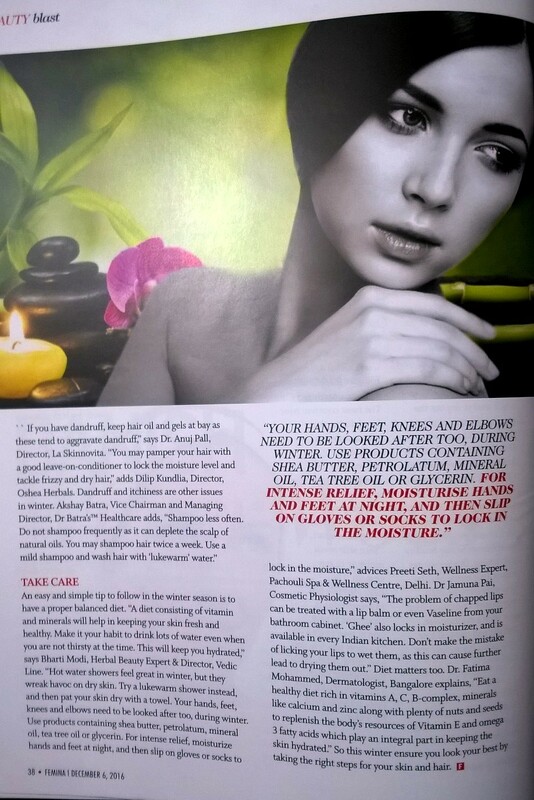 For intense relief, moisturize hands and feet at night, and then slip on gloves or socks to lock in the moisture,” advices Preeti Seth, Wellness Expert, Pachouli Spa & Wellness Centre, Delhi. Dr Jamuna Pai, Cosmetic Physiologist says, “the problem of chapped lips can be treated with a lip balm or even Vaseline from your bathroom cabinet. ‘Ghee’ also locks in moisturizer, and is available in every Indian kitchen. Don’t make the mistake of licking your lips to wet them, as this can cause further drying out.” Diet matters too. 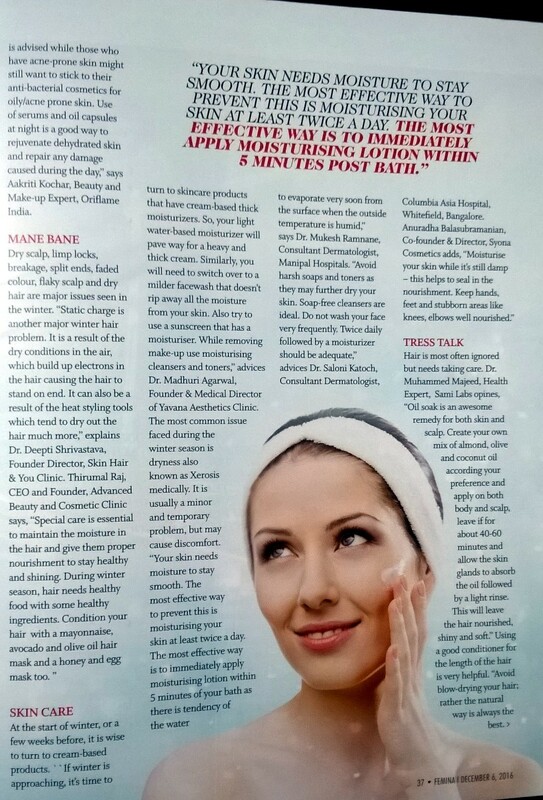 Dr. Fatima Mohammed, Dermatologist, Bangalore explains, “a healthy diet rich in vitamins A, C, B-complex,. Minerals like calcium and Zinc along with plenty of nuts and seeds to replenish the body’s resources of Vitamin E and omega 3 fatty acids which play an integral part in the skin barrier –hydrating mechanism.” So this winter ensure you look your best by taking the right steps for your skin and hair.